On a bright and sunny Tuesday morning, EMIN bus trundled out of Budapest and Hungary to enter the beautiful Eastern mountains of Slovakia. Whilst the journey itself to Rimavksa-Sobota was relatively easy and without incident, the day burst into life upon our arrival at the hotel where we were more than warmly greeted by the local network. 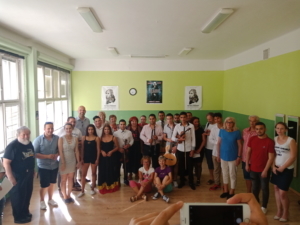 After checking in and having lunch with our Slovakia colleagues we began the first part of our programme with a visit to a local secondary school which gives admittance preference to children of the Roma community. In the meeting hosted by the school we were introduced to Fr. Peter Gombita the EMIN bus ambassador to local communities whilst we are in Slovakia. Fr. Gombita is a Catholic priest and the director of a Slovakian shelter and community project called Oasis. Fr. Gombita thanked the bus for visiting what he called the poorest region in all of Slovakia. He pointed out that it is important for a campaign such as ours to engage with people who are in the most need of minimum income schemes. He then described his own project in which he takes in some of the most desolate people in society. Fr. Gombita described how poverty can often dehumanize these people to such an extent they are unable to reenter the workforce but can only think as far ahead as the next meal. He described how many of the people he has taken have ranged from PhD’s to primary school education, from doctors to those who’ve never had a full-time job. This point is extremely important in proving wrong one of the many stigmatizing myths opponents of minimum income argue. That being that those who receive benefits do not want to work, rather it is often the lack of minimum income that leads to an awful snowball effect of being unable to reenter the labor market and further down to social exclusion. 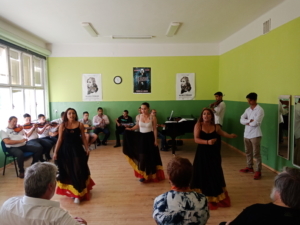 After the speeches, we were treated to a wonderful display of local Slovakian and Roma fusion drama. The students turned out to be amazingly talented musicians and quite good actors, too. It was fantastic to see young people from the majority community and a minority community work together with such a beautiful understanding and acceptance of each other’s culture. After the show, the day was still not complete. 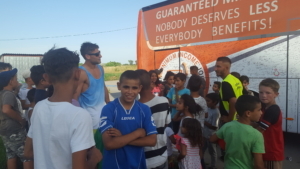 We ended the day by visiting a Roma community located on the outskirts of the city. Here we found a community that lives in truly impoverished conditions. We were shocked to learn that more than 1300 people lived in 6 tiny apartment blocks. We were further shocked to find that families were living on a minimum income of just 66 € a month, and more living on even no income. This community as with so many marginalized people, were well hidden from the main city and it took a journey down a back road to even get to the village. This sort of social inclusion must end if we are to build a fairer and better Europe for all her citizens. However, there was a vibrant defiance in these people’s will to survive and their optimism for a better day. Tomorrow we will travel to Banka Bystrica to meet with the governor of the province and host a happening with the public around the bus in the main public square.